You asked for them, and here they are... the pre-chapters, the post-chapters and the in-between chapters of Don Rosa's Life and Times of Scrooge McDuck! Included in this companion are the stories "The Cowboy Captain of the Cutty Sark," "The Vigilante of Pizen Bluff," "The Prisoner of White Agony Creek," "Hearts of the Yukon" and "Sharpie of the Culebra Cut." Finally rounding out the collection are two slightly unusual takes on Scrooge's life: "Of Ducks and Dimes and Destinies" and "Dream of a Lifetime" in which the Beagle Boys invade Scrooge's subconscious mind (!) 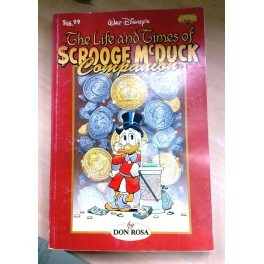 and wreak havoc during dream-versions of the various "Life of Scrooge" chapters.